As I’ve looked at tough horse fodder-like kale in markets recently, I’ve shied away from raw kale in favor of the cooked version. Like the lion on the April 7th New Yorker cover, I need to turn over a new leaf, while I wait for early salad kale in my garden. A couple of weeks ago I had the opportunity to observe an enticing cooking demo featuring Paul Flynn, a gifted Irish chef and owner of The Tannery Restaurant in Dungarvan, Ireland. I was visiting my favorite place away from home, the Ballymaloe (pronounced “Bally-mah-LOO”) Cookery School, and I lucked out to be on the sidelines of this brilliant presentation. Paul specializes in taking traditional Irish foods and reworking them into tasty contemporary dishes. Hence, kale that grows literally year-round in Ireland, and mushrooms, often found wild. 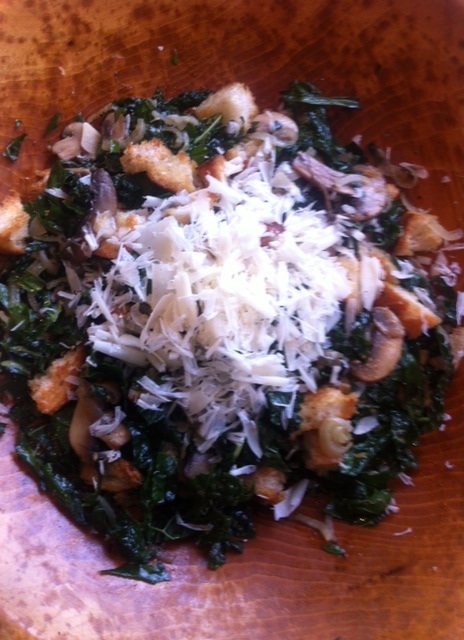 Paul’s semi-wilted kale salad is reminiscent of Italian panzanella with toasted croutons, sautéed mushrooms, and shaved Parmesan. It makes way for additional leftover bits of roast pork, lamb or chicken, turning the salad into a full meal. It’s better made at least an hour ahead and is even delicious the next day. For this salad I chose a bunch of smaller-leafed organic Lacinato (Tuscan) kale. These dark leaves turned deep green with the dressing and held their color through the following day. Toss the bread chunks with 1 tablespoon olive oil, spread on baking sheet, and toast until lightly golden in a 400° oven or under a low broiler. Warm 1 tablespoon olive oil in a skillet and gently sweat sliced onion until limp and tender. Wash kale, shake dry, strip green leaf from center stalk, and shred. (After removing the stalks, the green leafy part will weigh 4 oz. ; save the organic stalks to chop into soup or a stew.) Place kale in salad bowl; add warm onion. Raise heat under skillet; add 1 tablespoon oil and quickly sauté mushrooms half at a time, seasoning with salt and pepper. Tip hot mushrooms into salad bowl with kale and onion. Finally, add few more drops of oil to the skillet, reduce heat and gently sauté the chopped garlic just until fragrant. Swirl in vinegar, honey and pour over kale mixture in salad bowl. Add toasted bread; toss to combine. Taste for seasoning, adding salt and pepper as needed and a bit more vinegar or oil if desired. Top with shaved Parmesan before serving or add a few bits of warm roast chicken, leftover lamb or pork. Eat and be healthy! Serves 3-4. You are currently browsing the Mary Jo's Kitchen blog archives for April, 2014.